The example is made in worsted weight acrylic. There are two tutorial videos available for this blanket. Part one covers the beginning and body of the blanket. Part two covers the finishing rows of the blanket. The beginning chain should be a multiple of 24 plus 1. Row 1: 2dc in 4th chain from hook, dc in next 6 ch, dc3tog (uses 3 ch), dc in next 2 ch, dc3tog ** dc in next 6 ch, 3dc in next ch, dc in next two ch, 3dc in next ch, dc in next 6 ch, dc3tog (uses 3 ch), dc in next 2 ch, dc3tog. Repeat from ** across to last 7 chains. Dc in next 6 ch, (2dc, tr) in last ch. Turn. Row 2: Ch3 (counts as a dc), 2dc in tr, dc in next 6 dc, dc3tog in next three stitches, ch10, skip 2 dc, dc3tog in next three stitches, ** dc in next 6 dc, 3dc in next dc, ch10, skip 2 dc, 3dc in next dc, dc in next 6 dc, dc3tog in next three stitches, ch10, skip 2 dc, dc3tog in next three stitches. Repeat from ** across to last 6 dc and turning chain. Dc in next 6 dc, (2dc, tr) in top of turning chain. Turn. Row 3: Ch3 (counts as a dc), 2dc in tr, dc in next 6 dc, dc3tog in next three stitches, ch10, skip ch10, dc3tog in next three stitches, ** dc in next 6 dc, 3dc in next dc, ch10, skip ch10, 3dc in next dc, dc in next 6 dc, dc3tog in next three stitches, ch10, skip ch10, dc3tog in next three stitches. Repeat from ** across to last 6 dc and turning chain. Dc in next 6 dc, (2dc, tr) in top of turning chain. Turn. Second to last row: Ch3 (counts as a dc), 2dc in tr, dc in next 6 dc, dc3tog in next three stitches, ch6, skip ch10, dc3tog in next three stitches, ** dc in next 6 dc, 3dc in next dc, ch6, skip ch10, 3dc in next dc, dc in next 6 dc, dc3tog in next three stitches, ch6, skip ch10, dc3tog in next three stitches. Repeat from ** across to last 6 dc and turning chain. Dc in next 6 dc, (2dc, tr) in top of turning chain. Turn. Next to last row: Ch3 (counts as a dc), 2dc in tr, dc in next 6 dc, dc3tog in next three stitches, ch6, skip ch6, dc3tog in next three stitches, ** dc in next 6 dc, 3dc in next dc, ch6, skip ch6, 3dc in next dc, dc in next 6 dc, dc3tog in next three stitches, ch6, skip ch6, dc3tog in next three stitches. Repeat from ** across to last 6 dc and turning chain. Dc in next 6 dc, (2dc, tr) in top of turning chain. Turn. As you work the last row, you will need to draw up the loops of each loop column as you come to it. Starting at the bottom of the column, pull the first over the second and pull the second loop through it toward the front. Then pull that loop over the third loop and pull the third loop through to the front. Continue in this way up the column. You will then make stitches from the last row in this top loop to secure it. If you would like to see a tutorial on looping, Linda of alottastitches has a great post about it, as well as a lot of other great tips on this blanket. Last row: Ch3 (counts as a dc), 2dc in tr, dc in next 6 dc, dc3tog in next three stitches, loop the column to the top and make 2 dc in top loop, dc3tog in next three stitches, ** dc in next 6 dc, 3dc in next dc, loop the column to the top and make 2 dc in top loop, 3dc in next dc, dc in next 6 dc, dc3tog in next three stitches, loop the column to the top and make 2 dc in top loop, dc3tog in next three stitches. Repeat from ** across to last 6 dc and turning chain. Dc in next 6 dc, (2dc, tr) in top of turning chain. Finish off and weave in end. Love it! Thank you for sharing your pattern. Love this pattern, have made a few in my time, thanks so much for sharing the pattern. I think I’d make the Jacobs Ladder Ripple Afghan, but I think unless someone I was making it for wanted darker colors I’d go with brighter. Not sure which colors, I suppose it would depend on what I had on hand, and if I could afford to buy more yarn. Many MANY years ago a neighbor jotted down on an old piece of paper a very simple afghan pattern. All I can remember is that it was at least 100 chains long and you Double crocheted in the first 10 chains, then you chained ten,skipping 10 chains double crochet in the next…continuing this pattern to the end. If I remember correctly it was a chain 3 turn and follow this same pattern for as long as you want this afghan. I gave several away and used mine as an extra winter blanket..anyway, in the chain 10 spaces starting at the bottom you would make a twist and then pull the next row up through this twist again following all the way to end.and then you single crochet all around and add fringe or tassels if you want. Can ANYONE find me such a pattern? THANKS! I have done many baby afghans in this original stitch and then felt the weave together turned out after awhile – loosed up so that is why I – only chained 8 and then twisted so looked more cable look. Especially when using a light weight yarn or very soft yarn…. LOVE IT…..
ch10, skip ch10. So you continuously have ten chains on top of each other? How do they connect to each other? Or, are they loose? They will be loose like that until the blanket is as long as you want it. Then you will do the last few special rows and with the last row, you will loop all those chains up from the bottom to the top and catch the top loop in the last row of crochet. I love this kind of afghan. I also have done the chain 10 where when I put together I will twist is half a turn so looks like an addt’l cable on the pattern. Never thought of this in a ripple tho… Thank you so very much…. I am a huge fan of ripples. My favorite..Thanks for the great pattern once again Mama! I love this afghan. I have a grandson named Jacob and this will be a birthday gift to him. Thank you so much for the pattern. I love you site. I have made many many of these but never with that drop down stitch, this is the exact color combo I am making I will be using it for a bedspread,I alwasy seem to come back to the ripple. I can see it will look wonderful this way. Thank you it is just beautiful you did a great job. I’m a beginner. Isn’t there an easier ripple pattern? I have a question. I’ve never done a ripple pattern before and honestly this is my first time reading a full pattern. Are the chains of 10 supposed to be right on top of each other like a regular Jacob ladder? Mine are off set of one another and I’m not sure if I’m doing it correctly. If not I’m not sure where I went wrong. Pics would be great but right now any help would be great. The chain segments should line up. If you look back at the pattern again, I’ve added a photo of the blanket in progress with the chains unlinked. Hope that helps diagnose what is happening with your blanket. Thank you so much! After starting over I found my mistake. The picture has helped me stay on track. It is much easier for me to have visuals to go off of as well. Thanks again for your help and for your great site. I have been reading many post from people and your replies, it has been helpful. I’m excited to try many of your patterns. Love this pattern, I am fixing to start making a couple different blankets & this is might make it on the list as one of them that I am going to make! I love your patterns. What more is there to say. I added a chart that I’ve been including for my more recent patterns that has the ounces and yardage for the different sizes. I also added two more larger sizes. It still just has a total yarn amount. The amount of each depends on if you want equal width stripes of the different colors or not. Let me know if you want more calculations based on your stripe pattern. I don’t see a link for the chart….am I missing it? It’s a size chart under Size pretty close to the top of the pattern. I have a pillow pattern that matches this afghan, and have made at least twenty five of them. Now I will make the afghan as a set, for gifts. Thank you for the pattern. My pillow pattern is round. This is such a clever idea! I wonder if it wouldn’t work with a round ripple ‘ghan. I’m gonna give it a try! I’ve crocheted 3 Jacob Ladder blankets, but this one beats all. It’s lovely, and I just started it. Can’t wait for the completion to post on my FB wall. OMG! this is absolutely BEAUTIFUL! and in my FAVORITE COLORS! This kind of reminds me of the Mile Long Afghan that a Youtuber created, the difference is you’re working strips then you crocheted them together when you’re done making your strips. I love crocheting this pattern. I’ve just started it and on 3rd row. I’m confused because it appears that with each row it is getting wider. I’m crocheting with mohair yarn and i really don’t want to ruin this. Will the last 3 rows make it be a straight edge on the sides? Help Please. I’ll be waiting to hear from you and hope you have a very Merry Christmas!! Have you seen this blog post about this blanket? She has a lot of great pictures which might help you see if yours is going right. Let me know if you still think something is wrong. Maybe you could send me a picture of yours if you are still concerned. When I do the ch 10 on the 2nd row and then sk 2 dc do I actually skip 10 on the 1st row or immediately sk the next 2 dc? Thank you for any help. You just skip 2 dc and then pick up again. So in other words in the second row, there will be a ch 10 loop above 2 skipped dc stitches at each peak and valley of the ripple going across. The ch 10 will be loose and look funny, but when you loop them all up at the end of the the project they make sense. I’m wondering about looping the chains. It leaves an open gap at the bottom which doesn’t look good. Is the first chain supposed to loop between the 2 DC below it? I love this pattern and am about half done with my first one. Thank you so much for this pattern!!! I think if you loop the first chain between those 2 dc it will pull it too tight and cause a ripple at the bottom. That hole is one of the carry overs from the original Jacob’s Ladder that this one is based on. I think some people have stitched the hole shut. When I designed this one, I pondered that problem and couldn’t ever come up with a solution that I liked. I ended up twisting the first chain twice and the rest of the chains once. There’s still a hole at the bottom but it’s small and hardly noticeable. I used colors really close to what’s in your pictures: Red Heart Super Saver Windsor Blue, Country Blue and Light Grey. I’m very happy with how it turned out. Thanks again for this pattern! If you’d like to see a picture of it, I’m on Ravelry as “Stueysmom”. I can’t figure out what I’m doing wrong. I’ve started over 3 times with the same result each time. I need your help. One end grows with each row and the other shrinks.I tried to send a pic but can’t figure it out. I sent you an e-mail with my e-mail address. I’d love to see a picture to try to diagnose the problem. I really like this pattern, however it doesn’t tell you what the color combination is. These colors would be perfect for my son. If you can tell me what the colors are please email me, I would greatly appreciate it. It’s all Caron Simply Soft. repeated for length of blanket and ended with 8 rows of Dark Country Blue. Can you tell me how much of each color it took? Sorry, my question was incomplete. If I wanted to make this exactly like yours, in the large size, how much yarn do I need of each color? I used Caron Simply Soft. The strip pattern is 8 rows of Dark Country Blue, 4 rows of Country Blue, 8 rows of Light Country Blue. This is repeated for the length of the blanket and then finished with 8 rows of the Dark Country Blue. To get a large with that repeat it will need to be 78 inches long. The pattern will be repeated 4 times for the length. You will need 920 yards of each the Country Blue and Light Country Blue and 1150 yards of the Dark Country Blue. I’m finally ready to buy the yarn and start this project but realized I still have some confusion. The yardage you were so kind to give me for the 3 colors in your afghan ,for the large size, add up to 2990 yards, whereas your chart indicates a total of 2537.91 for the large size so I’m not sure where to go with this. Am I missing something somewhere? Thanks for your help. In the chart the large is 67 inches long. To get the striping pattern I made you will need to make it 78 inches long, so will take more yarn. Thank you so much for this pattern I am in Australia and find it hard to get patterns this is beautiful. Perfect for a baby as little fingers won’t get caught. I made a couple of tutorial videos for it. I hope they are helpful. If not, please let me know. Such a beautiful pattern but I seem to be having a problem. As I work the 2 dc, 1 tr into the turning chain the edges end up at an angle makeing it wider and wider instead of a straight line. Any advice? Make sure you always have 6 dc between the dc3tog and the 2dc/tr at the beginning and end of each row. I had a request for a tutorial video, so that may also be helpful. I seen your pattern for jacobs ladder ripple afghan and decided to have a go. It has come out really well, and I am very pleased with it, but I wasnt to sure on the first 2 rows, which left a hole when you started to loop the loops up – so I adapted it slightly and it stops the hole thing…. All I did was on the first 2 foundation rows between the 2 (dc3tog) + the 2 (3dc in next ch)where you had put 2 dc, I just put in 10ch as the rest of the pattern was, it did mean the starting chain was longer to compensate for the extra 8 chain on every hill/vale, but when you come to loop the chains, the first one on the first row you just twist the chain twice before looping it into the next loop above. I twisted the first loop the opposite way to the rest of the loops on the first row only. I would send you a picture, but not sure how to get it off my phone onto your page just yet. Hello Sue could you please tell me how many extra chains to add to my foundation row so that I avoid the big holes at the bottom? Also did you mean the foundation row and the second to last row? You said first 2 foundation rows and since I am just starting to crochet more complex patterns I want to make sure that I get this one correct. I love the idea of no holes at the bottom. Thanks in advance for your reply. I did add a couple more chains just to be on safe side, you can always undo them if you have to many. in row 1 I chained 10 and skipped 10 instead of doing (dc in next 2 ch) I then followed pattern but every time it said (dc in next 2 ch) I ch 10 + skip 10. Thank you so much for responding. I am going to get started right away. Again thanks for the prompt and detailed response. I am absolutely thrilled to find this pattern!! I saw it about 4 months ago in a bok but the book was over $40.00 and this was the only pattern I wanted. Thank you so much for putting it in the public!! My grandson asked me to make him an afghan… this is THE one! I can’t wait to start..I’ll go over your tutorials thoroughly! I’ve made ripples before but this one is unique..Thanks again! I just started crocheting again and love this pattern. Someone mentioned having done this in a round pillow. An old friend of mine gave me the instructions for the pillow and I can’t find them. Unfortunately she has passed away. Does anyone know how to do this in a round pillow, no ripples? Many thanks. I couldn’t find a pillow, but I would think you could use these on the two sides. Years ago I found directions for a Jacob’s Ladder baby blanket in a yarn store in Houma, LA. They were typed on a sheet of paper. Yes, typed, with a typewriter. So you know how long ago that was. I didn’t know the name of the pattern until I found it on the internet. The directions got lost in multiple moves but I was able to make it again by careful counting. This pattern makes the most beautiful baby blankets! It’s my go-to pattern for new babies. 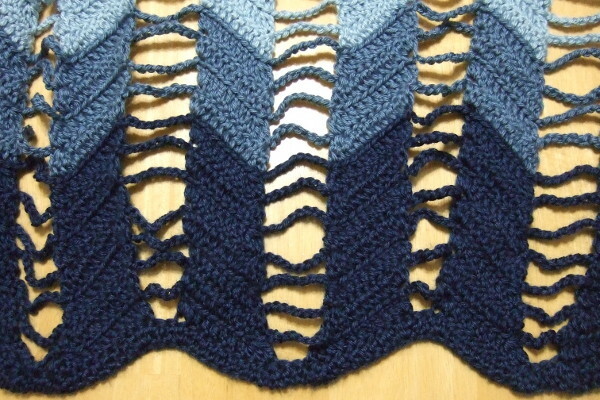 I have also made a few afghans in various ripple designs but I have never seen the two combined. It’s absolutely gorgeous! I’m gathering yarn in my closet(I’m a hopeless hoarder) to make it right now. I love it and can’t wait to start. Thank you! I have been looking for this pattern.. The one I made many years ago just went straight across…. I’m so glad to find it… I had my mother in law to get me started so wish me luck.. I’m on my own! dc3tog (uses 3 ch),Would you explain how to do this stitch. I’ve used this technique on granny squares, but never ever thought of applying it to a larger project. Thanks for trying it and sharing the idea! Hi I have started this blanket and for some reason my ends are wider than what they should be. I have checked out the blog mentioned in previous comments and don’t understand what I am doing wrong. I have watched the videos over and over again as well. Can anyone help me please? Could you send me a picture? I’m not sure without seeing it. You can send a picture to mama at thetucker dot com. I’m going to give this a try. The ladder part seems a bit daunting, but with the tutorials it should be fine. Thank you for sharing this with me. I’m working this pattern now..love love love! I’m wondering about a border?? Is it possible & any suggestions welcome! Thanks so much for sharing! ! If you wanted to add a single crochet border, add two extra sc in each of the four corners. At each side of the peak add an extra sc and on each side of the valley, skip a sc. 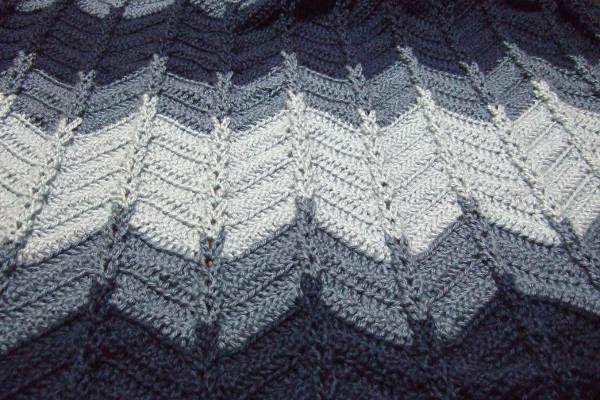 Do you know about how many rows it takes to make a medium size afghan? I absolutely love this pattern. I”ve made it in cranberry/brown/cream. It comes out looking so much more advanced than the normal ripple pattern. As I made it as an afghan to go over the couch, I simply added over sized buttons to cover the holes. It adds a nice touch. Beginner here. Just wondering, when you state, ‘3dc in next dc’ are you referring to a cluster stitch? No. A cluster is made in a single stitch as these are, but a cluster meets at the top, so that the top is a single stitch. 3 dc in a stitch make an increase, since they are made in a single stitch, but result in three stitches at the top. Ripples use increase stitches to make the “peaks” and decrease stitches to make the “valleys”. I did a sample of your pattern (73 chains) and I must say that your pattern is fantastic! I love it! Thank you for this wonderful pattern! Your video looked like your were crocheting in the back loops only. The written directions I didn’t notice anything about back loops only. I was crocheting in the back loops only. I consider that the default crochet technique so didn’t mention it. Also, it can be done in both loops, but will just have a different look. How many skins of yarn did you use in each color? My example is just a small lap blanket of finished size 39″ by 42″. I want to make this afghan in the same colors as this one but I don’t see how many oz. for each color it is! Please help me so I can make it! Oh and I want to make it for in the extra large afghan! I used Caron Simply Soft. The strip pattern is 8 rows of Dark Country Blue, 4 rows of Country Blue, 8 rows of Light Country Blue. 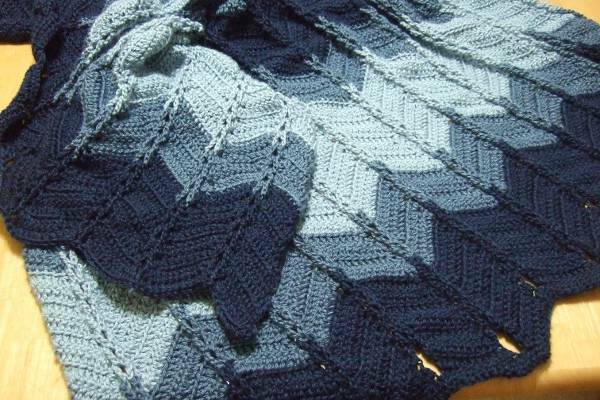 This is repeated for the length of the blanket and then finished with 8 rows of the Dark Country Blue. To get an extra large with that repeat it will need to be 78 inches long. The pattern will be repeated 4 times for the length. You will need 1030 yards of each the Country Blue and Light Country Blue and 1288 yards of the Dark Country Blue. Thank you for getting back to me with this info. !Now I can go out to buy the yarn! Many thanks to you! I had a similar idea back in 1988 or 1989, but I only did the Jacob’s Ladder from the bottoms of the ripples, and I made a potholder for a contest and got first place for it. I haven’t made it in a while, but I think I used sc instead of dc so that I had a nice thick potholder. I got the idea from an afghan my sister made for me using straight rows with Jacob’s ladder every 10 stitches or so. I love putting stitches and patterns together in new ways, and obviously you do too. First off, thank you so much for the wonderful pattern! I’m making one for my grandson using caron big cakes in blueberry torte and it’s turning out gorgeous! I’ve never done a Jacob’s Ladder blanket and I am thoroughly enjoying it. For those that think it is getting wider with the 2 dc and 1 tc in the turn, I thought it looked like it too and was considering dropping the treble. I decided that as long as the stitch count was consistent it is actually making the smoothest, straightest edge of any blanket I’ve ever made. No border needed! Thanks again for the awesome pattern! Is there a way to make the blanket so it does not have the open spaces at the end when you pull them through like is shown on the bottom of the picture? That’s the nature of the Jacob’s Ladder type method. There is some discussion in the comments about it and some have some things they do after the fact to close the holes. I am so glad I found your pattern. Back in the late 80’s, a friend of mine showed me Jacob’s ladder. I started it once, but never found out how to finish it. After a while, I forgot what the name of the pattern was, and all I knew was that it looked like a knit stitch where the chains were. I remembered it was suppose to be easy and quick, but could never find the pattern until now…yay!